Richmond’s VFL squad has suffered a crushing 96-point defeat at the hands of Werribee at Avalon Airport Oval on Saturday afternoon. The Tigers struggled to match Werribee’s intensity early, with the home side piling on six goals to one in the first quarter. Werribee took a 32-point lead into the first break, and continued their ascendancy for the remainder of the game, keeping Richmond goalless in the third quarter. VFL coach Tim Clarke attributed the loss to his team’s inability to gain any control of the contest. “Similar to last week, it started off with the midfield. Their midfielders really came to play. They beat us in and around the ball. They outnumbered us in every contest,” he said. Clarke was quick to praise the efforts of his captain Jarryd Cachia, who was a standout for the Tigers. He finished with 27 touches (15 contested), eight tackles and seven clearances, and provided much-needed intensity around the stoppages. “Cachia kept fighting all day, he just didn’t have any friends with him. (Matt) Thomas was down in numbers. Matt McDonough was down in numbers. They really got beaten,” Clarke said. Sam Lloyd booted three goals as the only multiple goalkicker for the Tigers, but his efforts were to no avail in the face of Werribee’s dominance. Chris Newman’s return after three weeks on the sidelines was a positive one. He came on in the second quarter and finished with 16 disposals and four tackles, playing a key role in several passages of play from the backline. Richmond heads into the bye with two wins and six losses for the season so far. 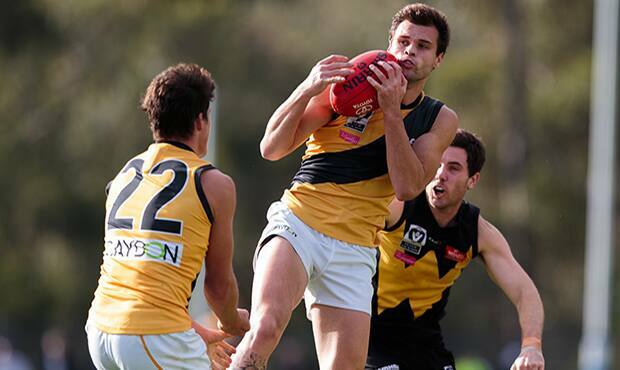 Richmond midfielder Matt Thomas in action against Werribee in the VFL.